This show is guest hosted by Allister Jenks. Dorothy, aka MacLurker, reviews the Watershot Underwater camera housing for iPhone, Bart reviews the IcyDock EZ-Dock hard drive “toaster” for cheaper disk expansion, I review AnyFont for installing your own fonts on iOS and Melissa Davis, aka TheMacMommy, joins me to discuss teaching the old and young how to use modern technology – is it hard or just scary? Hi this is Allister Jenks standing in for Allison Sheridan on the NosillaCast Mac Podcast, hosted at Podfeet.com, a technology geek podcast with an EVER so slight Macintosh bias. Today is Sunday March 16th, 2014 and this is show number 462. Well as I record this, Allison and Steve are one step closer to home having completed the New Zealand leg of their holiday and are now relaxing in Tahiti, so I am your final guest host before Allison takes back the reins and quality controller Steve is back on the job. I sure hope they’re getting their energy back in Tahiti, because Allison asked me to remind you that if you’re going to go to Macworld, she hopes you’ll come to the NosillaCastaways party at Jillians on Friday night 28 March from 6-8pm. That’s less than two weeks away! Be sure to sign up for the party so the scary bouncers will let you in. Go to podfeet.com and click on NosillaCastaways Party 2014 in the tab in the menu bar, or go to the link in the shownotes. The double secret password to get in is ClarifyRules! For everyone who can’t attend, Kevin and Steve are valiantly working out how to have a Google Hangout on Air so that people from far away can talk to people at the party. Their first test wasn’t a raging success but they’ll get there! MacLurker here with a review of the Watershot Underwater camera housing for the iPhone. Last October, we took my brother Bob on a week’s cruise in the Sea of Cortez. All went well, until one rainy night, when Bob was helping us position the dinghy in the marina. In a disastrous moment, the dinghy went one way, the boat went another, and Bob knew he was headed for the water. Thinking faster than humanly possible, he dug into his pocket, grabbed his iPhone, and tossed up it to my husband, Marc, before splashing into the cold salty water. Fortunately Marc thinks fast too and was able to catch the iPhone. Bob was soon fished out of the water. Happy ending: Bob safe, iPhone safe & dry. All this got Marc thinking. He watches me scramble in and out of the dinghy all the time. I guess I don’t look very agile, because he decided this activity has put my iPhone at risk. So he hunted around on-line and found the Watershot Underwater Camera Housing. 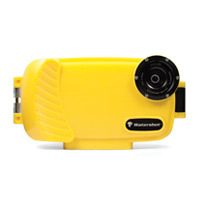 The WaterShot is a hard plastic case, transparent on one side and bright yellow on the other. It’s primarily designed to convert your iPhone into an underwater camera. It’s waterproof and holds an iPhone snugly with protective bumpers. So it works as a protective case as well. It comes with a wrist lanyard, but you can get a buoyant lanyard (also in bright yellow) as well, for when you drop it overboard, which I will probably do at some point. The Watershot case is depth rated to 130 feet or 40 meters. According the manufacturer’s website, watershot.com, the Watershot case is built to live in the water and withstand rocks, reefs, salt, sand, and extreme pressure. A full suspension system “floats” your phone inside the housing for maximum protection. A glass lens on the case aligns with the phone camera lens. The lens includes a threaded lens bezel, so you can screw on any lens or filter that you want. The case also includes a universal tripod mount with an available adapter for GoPro mounts. The Watershot case has four external buttons that activate the iPhone once it is snugly sealed inside. One button is the home button, but the other three allow you to take pictures, start video recording, review pix, change configurations, and transmit them to Twitter. All with the help of the free Watershot app. The app allows complete picture taking & sharing control, all from the three external buttons. Any pictures taken are automatically stored in your iPhone camera roll and can be manipulated with any of your photo apps, once you remove the iPhone from the Watershot case. The Watershot makers recommend that you disable screen locking before sealing the iPhone in the case, so you won’t have to open the case to swipe & unlock. They also recommend that you place the app icon in the home row in the left or right hand corner, so that you can start the app from the external buttons on the case. I took my new Watershot case on our recent cruise and found it worked very well as a protective case. And I love the installation instructions that recommend that you seal a piece of tissue paper in the case and submerge it in water for 15 minutes to verify that the case is truly water-proof. All BEFORE you trust your hydrophobic iPhone to its care. The app installs and runs well too. I had no trouble taking pictures of our various land and water adventures. One problem with the app however. Once the iPhone is closed up in the case, it is impossible to see the app buttons. They are hidden below the external buttons. This left me trying to remember which one was the video/still-photo switch or the shutter release. You pretty much have to memorize the button locations before hand. I ended up with a 10-minute video of my knee close-up walking after fumbling with the buttons. They really need to move the button labels or make them bigger, even at the cost of covering up the picture. No doubt, after a few uses, I will have the buttons learned, but it was a nuisance the first time out. The other downer was that the case is made to hold the iPhone very tightly. This is good because your iPhone is protected from bumps. But this also means that you need to remove any existing case and just put the naked iPhone in the Watershot. Which makes it kind of a pain to switch from land to water use. However, overall the Watershot does a great job protecting my iPhone and keeping it dry. I had no qualms bouncing my iPhone around as I scrambled over rocks and tide pools. And it survived just fine. Thanks, Dorothy, for a great review complete with a cautionary tale on why someone might want such a case. Entertaining and informative. Regular listeners will know that the folks at Blue Mango Learning, makers of the Clarify app, are sponsors of the podcast and that week in, week out, Allison never has trouble finding a story to tell about how Clarify helps her out. Knowing that I had a guest hosting spot coming up I thought about my own use of Clarify. “Aha!” I thought. I’ve been using it quite a bit lately to mark up single screen captures for posting online. Annnd, then Allison gave this exact tip in show 458. Can you believe it? I don’t use Clarify nearly as much as Allison (even though I own several licenses!) but soon enough something cropped up. This gig cropped up. I needed to record a CCATP and I needed to work out how to do that. Guy Serle over at MyMac.com has written a great article on setting up Skype, Soundboard and a microphone to record into GarageBand. I had gone through that and set up all the bits I needed in Audio Hijack Pro previously, so thought I’d use that setup for the CCATP recording. I contacted my guest and suggested we do a technical test. Our 90 minute test was a failure. Some stuff wasn’t audible. When it was, there was echo or the levels were way off. I called our test to a halt and went back to study Guy’s article. After some playing around I finally hit upon two things I had done wrong, one of which differed from Guy’s instructions because he used an earlier version of GarageBand. With all this fresh in my mind, it was time to make a record of these settings. But how? You guessed it. Clarify to the rescue. I didn’t even write any text in the steps – I just grabbed each and every screen from Audio Hijack Pro that had any non-default settings. I then connected Clarify to my Evernote account and saved it all there. Finally, I hit the share button and sent the link to my guest along with a note on which settings had solved the problems. If you’re new around here, save yourself some time and head on over to BlueMangoLearning.com and buy yourself a copy of Clarify. You won’t regret it. And if you’re not new around here, then you already own it. You DO own it, don’t you? Next up Bart Busschots is back with a story about his ever expanding need for hard drive space and how he keeps it in check. Selling on Amazon.com for between $40 and $60. 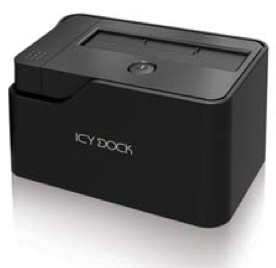 I bought the IcyDock as a replacement for an older un-branded dock. The older dock was USB 2, and could do SATA & IDE disks, but, it could not handle disks with sector sizes above 512k, which rules out some 2TB disks, and all 3 & 4TB disks. I’ve had one minor quibble with it – the spring-loaded dust cover had gotten dislodged in transit, so when the drive arrived it was not springing back into place when a drive was removed, but I could see that it had simply come out of it’s socket, so I pushed it back into place, it made a satisfying click, and has been perfect since (about three months ago). Thanks for that Bart. I have a drive toaster myself which I use primarily for backups, but I do wish it were a bit faster as it only has USB 2. BUT, I don’t have USB 3 on my Mac. BUT, I note that the IcyDock you reviewed does work with USB 2 so would work for me today and be future proof. If only Thunderbolt would take off. Back in November I was playing around trying to figure out how “per app VPN” worked on iOS. It was a new feature that Apple had announced with iOS 7 and I figured it might be a way to get some apps on my iPhone to talk to my company servers, giving me greater access to information when on the go. I never succeeded in figuring that out, but along the way I did stumble across the fact that it is possible to install just about any font you want on iOS devices. Those of you who are in the NosillaCast Google+ community may have seen my post there linking to my blog where I had created a Clarify tutorial on how to do it. It’s not terribly difficult, but there are a lot of steps. I’ve had some very grateful feedback on that blog post and it has become one of my most visited posts. Just recently I had a new comment pop up for approval that was kinda cool. A developer by the name of Florian Schimanke wanted to know what I thought of his app AnyFont which allows you to install fonts using only iTunes and hisiOS app. In fact, in some cases you don’t even need iTunes. How brilliant is that! Florian has done a great job with an excellent tutorial and FAQ built right into the app. 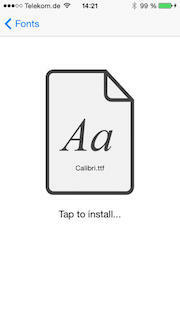 I tried it and found it very simple to install a font. I even managed to use the File Browser Pro app on my iPad to navigate to my Mac’s /Library/Fonts folder and then use Open In… to open the font file directly in AnyFont, from where I installed it. Yes, I installed a font on my iPad while lying in bed! Having your own font selections available in iWork makes a world of difference and now that it’s this easy I encourage you to grab AnyFont and start installing. AnyFont is $1.99 in the app store. CCATP — Melissa Davis on teaching technology to the young and old. Hard, or just scary? I love to compare 7 year olds with 77 year olds. I happen to be the parent of a 7 year old (and a 4 year old). I’ve worked with people of all different ages helping them or teaching them how to use Apple tech and most of my clients these days are in the 60 to 80 year old age group. A person’s life experiences work to shaped their personality and vice versa. Most small children, who presumably haven’t had much exposure to computers, who haven’t yet developed much of a fear for anything will use and embrace technology because they naturally explore things in their environment. Nowadays babies are born to parents who capture their very first moments with their smart phones. They’re accustomed to this thing their parents tote around – in addition to them – that glows and makes noise and constantly gets shoved in their little faces. Of course there are also parents who are careful to keep their babies away from the exposure to backlit displays for their own reasons. There are inconclusive studies out there that suggest backlit screen exposure can be harmful to developing eyes. I can not confirm or deny any of it at this point so I’m working off of experience with a healthy dose of caution and practice of moderation. Of course the nature vs nurture debate will come up here as well. Let’s think about the type of exposure. This could be a void of technology exposure in the home and limited to school or vice versa. It could be a third-world country. Think of the documentaries you’ve watched where film crews go to these countries to document the lives of people. Watch how some react to having people moving about with these large and small cameras and computers. Some are cautious, others are curious. Think about a generation of workers in the 80s and 90s who were introduced to computers in the workplace. So many times you’ll hear people say, “I use a computer at work all day, the last thing I want to do is stare at a screen for longer than I have to.” That generation is skeptical of computers. They’ve been taught computers and devices are for work, not play and that works could never be much fun. Work is not something to enjoy. Their exposure to computers has been, “if I press any other buttons besides the ones I’ve been instructed to press, I might blow up the computer and my boss will fire me.” That kind of exposure breeds fear so no wonder people in their 50s and 60s can be somewhat apprehensive to computers. They’re also the generation that believes Big Brother is out to get them. We’re seeing that again now with NSA. We’re all very cautious about using devices because of how they infringe upon our privacy or how we might get into trouble by using them. Lots of people either forget or don’t understand that you can operate software without being connected to the Internet! There are fun things you can do with computerized devices that don’t involve being “online.” This is where I have to teach them about using the Mail app versus Gmail. People both young and old see learning how to use computerized devices a chore or a task they need to learn and want to get it out of the way so they can go do something else. You could have children in which you’re trying to teach them something specific, say word processing and you’re getting into the nitty gritty of how to format a paragraph of text for a report. They may be daydreaming about the video game they want to play while you’re trying to teach them something fundamental. Older folks have short attention spans also. They get “fried” or “OD” pretty quickly. It’s no secret to us that time practically evaporates when we’re working on something technical whether it’s troubleshooting a problem (that time seems to go the quickest because you’re under stress to work some magic to fix it) or teaching someone how to do something. One of the biggest pieces of advice I can offer is that everyone learns things a little differently. When you’re working with someone you need to find out how they learn best and adapt your method of teaching them. Also consistency is key and hard to stick to when your working in a field where everything changes so rapidly, how do you keep consistent? Many people crave consistency. One way I try to achieve this is by drawing parallels across different apps. This is one of many things I love about the Mac OS. I can say things like, remember this last lesson we talked about how to search for things within an application and I told you to look for the little magnifying glass? Well what do you see right here? Notice how the symbol is the same? Another way to achieve consistency is by modifying the interface preferences — make everything look the same, enlarge the fonts, if you customize the toolbar for them, try to put similar tools in the same spots to reinforce muscle memory. What have you learned by teaching the old and young? Relating analog to digital examples helps. Do not take little things for granted. I cringe every time someone says, “Yeah, ya just hit enter.” There are people that don’t understand what it means to “Hit a key” and they don’t even know you meant a key on the keyboard for starters. Do not assume everyone understands all jargon. Look through their eyes and start slow and basic, then drop it down one more level lower because chances are you’re not aiming low enough. Ask them about their experiences first and try to gauge what terminology to use. When you say “to your left” be prepared to say, “your other left.” People get nervous when they’re being instructed and fumble over basic things and it’s natural. Do not make fun of them for it. You’re no better! Have a boat load of patience and get used to repeating yourself, hearing the same stories and questions over and over. Sometimes they need to stop and tell you a story. It’s how they process information and deal with overload. It’s ok. They know the clock is ticking and you’re charging for it. It took me a while to learn this and I felt very guilty at first, but friendships develop at a deeper level and it’s incredible important to for trust especially when you’re working with people who are showing you their banking and very personal information. It’s all personal. Very personal. Emotional. This is the most true when teaching people how to work with digital photos or how to make a birthday card or calendar. just your articles? I mean, what you say is important and everything. greatest in its niche. Very good blog!